Upon this spot stood the "Chapel of Ease," erected in 1730 for the ease and convenience of families living in distant parts of St. Anne's Parish. 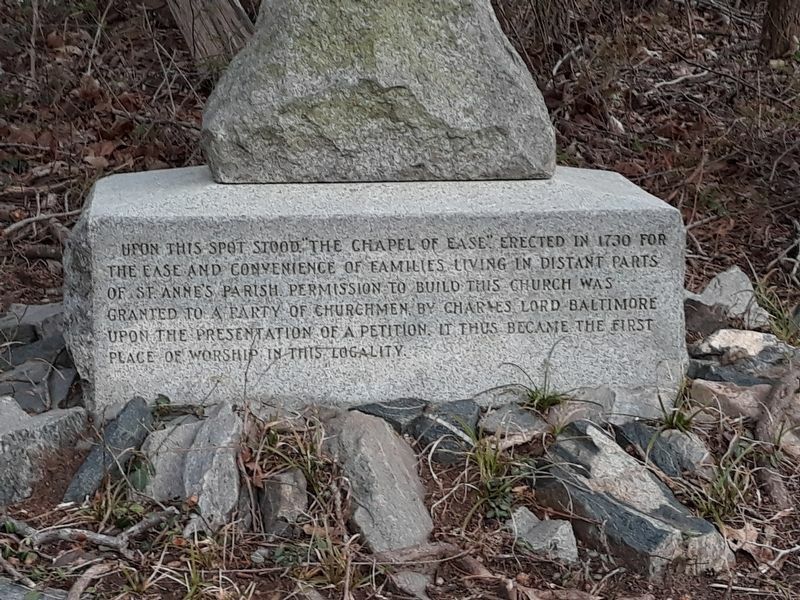 Permission to build this church was granted to a party of churchmen by Charles Lord Baltimore upon the presentation of a petition. It thus became the first place of worship in this locality. Location. 39° 2.546′ N, 76° 38.244′ W. Marker is in Crownsville, Maryland, in Anne Arundel County. Marker is on Severn Chapel Road 0.2 miles from Severn Chapel Road and Maud Lane, on the right when traveling north. Touch for map. Looking from RE Wilson & Son's School Bus garage driveway - the marker is at a southern angle across the street. It is recessed in the treeline off the road and obstructed by foliage but can be seen when during winter. It cannot be seen on overhead Google maps imagery. Marker is at or near this postal address: 1578 Severn Chapel Road, Crownsville MD 21032, United States of America. Touch for directions. Other nearby markers. At least 8 other markers are within 3 miles of this marker, measured as the crow flies. Anne Arundel Academy (approx. 0.9 miles away); Charles W. Baldwin Hall (approx. 1.3 miles away); Baldwin Memorial United Methodist Church (approx. 1.3 miles away); Old Stage-Coach Road (approx. 1.3 miles away); The Severn Crossroads Church (approx. 1.3 miles away); Count de Rochambeau’s (approx. 1.3 miles away); Henry Baldwin (approx. 1.6 miles away); Birthplace of Johns Hopkins (approx. 2.4 miles away). Touch for a list and map of all markers in Crownsville. More about this marker. This is a stone cross marker, Google maps street view only shows the bottom half due to tree branches blocking the view. More. Search the internet for Chapel of Ease. Credits. This page was last revised on March 25, 2019. This page originally submitted on March 24, 2019, by Frank Harder Sr. of Dumfries, Virginia. This page has been viewed 34 times since then. Photo 1. submitted on March 24, 2019, by Frank Harder Sr. of Dumfries, Virginia. • Andrew Ruppenstein was the editor who published this page. Editor’s want-list for this marker. Photo of the cross/monument • Can you help?